In partnership with ASH Scotland we have created new resources for smoke free spaces and to support Scotland’s Charter for a Tobacco-free Generation. These images are available for use with activity relating to Scotland’s Charter for a Tobacco-free Generation and may be used by organisations who have signed up in support of the Charter here. Specifically designed with early years services and primary schools in mind, these resources encourage smoke-free places for children to play, learn and socialise. This series of fun images featuring friendly, brightly coloured, superhero and cartoon characters have been designed to encourage people to keep children’s spaces smoke-free. If you would like a personalised poster (e.g. incorporating your school logo) please email cbennett@ashscotland.org.uk with details of your request. Play Scotland’s Smoke Free Information Sheet tells you more about how and why children benefit from smoke-free play. 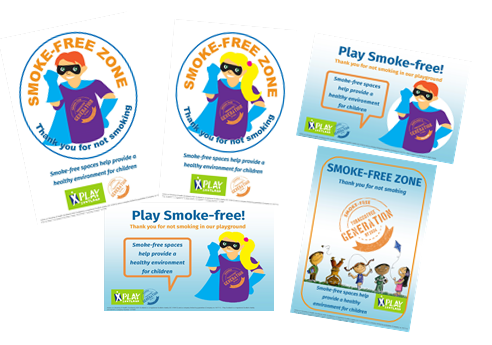 ASH Scotland have produced these short Smoke-free Play Case Studies from settings who have already introduced smoke-free zones. Tobacco-free Schools: a range of practical, user-friendly tools and support materials for schools developing tobacco policies, lessons and resources. Second-hand smoke activities and resource pack: This resource is for early years and family support workers, enabling you to run a session talking to parents about the harm caused by tobacco smoke in the home, and what they can do to protect their families. Children’s Rights & the Charter: an information poster linking the Charter to the United Nations Convention on the Rights of the Child. Tobacco-free youth projects: is a web resource designed to provide youth groups and youth workers with the information, resources and support that they need to develop and deliver tobacco prevention activities with the young people. to grow, learn, play and work.